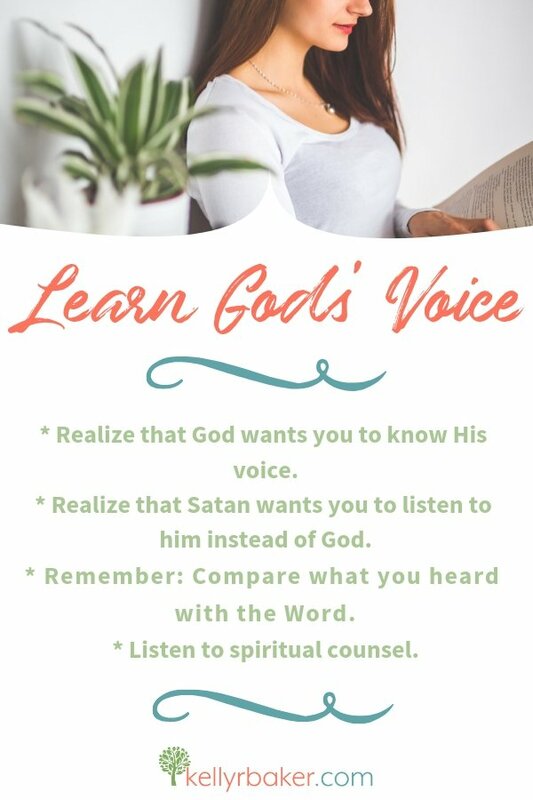 Do you want to learn God’s voice? If so, that’s great! It takes time, but you can and will if you apply these four tips. Read on for the next installment in the Biblical Foundation to Hear God’s Voice series. Standing in the younger children’s church classroom, I tried not to appear shocked that the director was stepping down from the job. She loved it! All I could think was why until she suggested I take it over. “What?? Nooo, there’s no way I could do that! I don’t have time. And this isn’t my main ministry….” The others continued talking and drowned out my protests, but they continued in my head. I will not take over this volunteer job! In the days that followed, the thought of being the new director kept popping into my head. The exchange with the freshly resigned director played over in my memory. I thought, Maybe she’s just discouraged and isn’t supposed to step down. Maybe I’m supposed to pray for her. But in the middle of praying for her, I started daydreaming about being the new director. When I realized it, I snapped myself out of it. This pattern continued for at least a couple of mornings before I decided to call the overseeing pastor. I found out she was burnt out from doing it for so many years. After our phone call, I was left with the task of praying about taking her place. As I continued to take it to God, He gave me a new vision for the class through a flood of ideas and details on organizing it all. As the days passed, excitement and passion for taking the job surpassed any previous protests. God gave me the desire to teach the class every week for a year instead of rotating teachers. By the end of the year, He would reveal the new director. Realize that God wants you to know His voice. Some days I forget that. But He’s gentle; He says come (Matthew 11:28). Realize that Satan wants you to listen to him instead of God. Any time you’re in a season of trying to hear God’s voice, the father of lies will tell you things about you that aren’t true (the opposite of what the Word says about you). Or he will suggest an alteration to God’s instructions. Since God has given you authority over all the power of the enemy (Luke 10:19), remember to cast down lies and command that liar to go! Remember: Compare what you heard with the Word. Say it with me now, “Compare what you heard with the Word.” God will never go against His word, or change the meaning of scripture to agree with a voice you heard. Learn God’s voice, but don’t get flaky. I pray I will never be deceived, and I pray this over my children, too. You’re the friend of God, and the word friend implies a certain degree of intimacy. Yet, any truth taken into extremes can be made into an error. Intimacy with God is certainly a good thing, but if you pridefully forget your place you may be headed down a dangerous slope. You might start hearing a voice that you think is God, but is actually the deceiver (2 Corinthians 11:14). We have sadly seen people be so deceived that they believe God has shown them a private interpretation (2 Peter 1:20). Those people eventually turn away from God or to other religions, or continue to believe they are walking in the Light while teaching false doctrine. If something comes to mind repeatedly while praying, God might be speaking. Continue to take it to God, and if details emerge, God may be revealing His will like in my story above. One caveat to this is to always check with your spiritual authority. Without a doubt, God had spoken so clearly to me. But I knew one confirmation remained. What did my husband and pastor say? They approved this new plan, and over the next year every detail came to fruition. A man in our church got saved and was on fire for God. Then a few weeks later, he said God was telling him to go on a traveling ministry and preach full time. While that sounds awesome, God was planting the seed for ministry in his heart. The problem was he felt God wanted him to start right away. He lacked spiritual maturity and couldn’t control his fleshly desires. He refused counsel and backslid a short time later. It’s not your job to manipulate God to follow what’s in your heart. Once a woman told us that God said for her to divorce her husband and marry another man. She was being led away by a spirit of adultery. Unfortunately, she didn’t heed the counsel, obeyed the wrong voice, and ran off with the other man. In my story above, God began calling me to a temporary assignment through the news that the previous director was stepping down. Then the enemy threw lies of inadequacy and lack of time at me, hoping that I would stubbornly refuse. I could have missed it all if I had taken the stance that “this isn’t my ministry.” I would have been deceived out of a chance to serve. Finally, my spiritual authorities confirmed the assignment. Faithfully apply these tips and you will learn God’s voice! What other ways can we learn God’s voice? It takes a humility to receive from others who have a greater wisdom. I learned the hard way that being teachable is best. Thanks for sharing your thoughts, Betsy! Thank you for this post, Kelly. I’m pinning it to my Spiritual Disciplines board–because we do what we do so we’ll know the Voice when it comes. Thanks for pinning it, Michele!